It appears that the old 3DS has better battery life. If you are not a regular, please move yourself there immediately. Take a 15 minute break per every 1 hour of playtime. Some games even notify you about this. The NDS/3DS game carts do not break by accident. This makes buying them pre-owned somewhat safe. You can get an youtube application from the Nintendo eShop for ''old'' 3DS/2DS systems. Why don't they make movie cartridges? Has the idea ever been conceived? Game Updates and patches are free. The system will tell you to update when you select a game in home menu. Just go for a ''NEW'' 3DS or 2DS. There really is no reason to buy any of the old models today. There are two ways to get updates; Internet or on a game cart. What was your first Nintendo handheld? Have you used circle pad pro or ''the kn*b'' ? What size of a SD card are you using? Are you going to get a Switch after 3DS/2DS? In what year did you get your first 3DS/2DS? 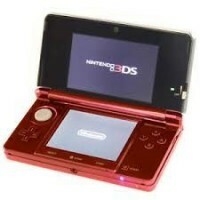 What 3DS device are you using?